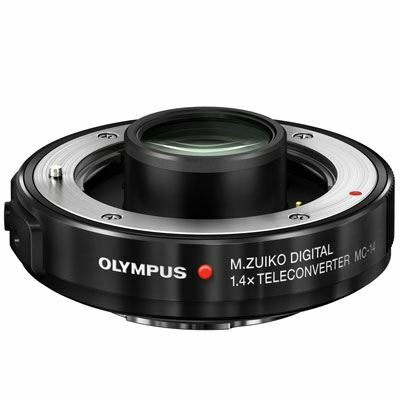 Give yourself some additional reach with the M.Zuiko Digital MC-14 1.4x Teleconverter from Olympus. Designed for full compatibility with the M.Zuiko Digital ED 40-150mm f/2.8 PRO and M.Zuiko Digital ED 300m f/4 PRO lenses, the MC-14's 1.4x magnification factor will provide users with a lens focal length of 56-210mm and 420mm, respectively. These are equivalent to 112-420mm and 840mm in 35mm format. It also features a metal build that is dust-, freeze-, and splash-proof and utilizes 6 optical elements. Additionally, a case is included for storage and protection. he Olympus 1.4x is a dedicated teleconverter for the Olympus ED 40-150mm f2.8 PRO and ED 300mm f4 PRO Micro Four Thirds lenses. At just 15mm thick, the 1.4x is a great addition to any photographer's kit looking to expand the zoom range of their existing telephoto lens. Lightweight and easily portable, the teleconverter features a robust, metal-cased, dust, splash and freeze-proof build quality to ensure you'll always be able to keep shooting, in any environment. The aperture value will be one step darker when outfitted with the teleconverter.